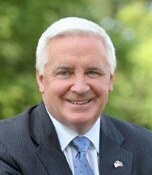 Tom Corbett, the newly elected Governor of Pennsylvania, spoke on March 17th to an audience of business leaders at the Scranton Chamber of Commerce. This was the Governor's first visit to the Electric City. He started out by stating that he meant all the pre-election promises he made concerning taxes. No tax increases…especially for the business community. I hope the Governor can make this promise stick. I agree with his statement, "The government cannot create wealth. The private sector creates wealth and through job creation Pennsylvania will successfully move forward." He continued, "We (the Commonwealth of PA) need to do what's necessary to give businesses an opportunity to hire again." Like most states in the country, Pennsylvania faces a budget hole. In the Commonwealth's case, that number is a staggering $4.3 billion. Gov. Corbett said, "Spending got us into this mess so we need to make painful cuts in spending to bring this situation under control. We cannot tax our way out of the shortfall." The Governor sounds committed to bringing and keeping industry in PA. He provided an example in the natural gas boom underway with the Marcellus Shale play. He stated that through the research his staff provided the total revenue expected from all work associated with the Marcellus Shale will equal $250 billion over the next 30 years. Happy St. Patrick's Day, Mr. Governor. Here's to keeping the green in Pennsylvania and taxes out.